FBR Franchise Business Review claims to be a respected franchise market research. A critic claims that FBR is a franchise lead generation firm that cleverly enables franchisors to circumvent the FTC prohibition against making undisclosed and unsubstantiated earnings claims. We’re a little confused about how they work exactly, but Franchise Business Review apparently conducts franchisee surveys for participating franchisors. Negative results, it seems, are never released publicly. If the franchisee survey results have franchise marketing value, they are packaged into reports that the franchisors can use to boost their credibility or in their franchise sales efforts. Franchise Business Review offers participating franchisors advertising and lead generation options in connection with its website and a slew of slick, glossy digital publications. FBR claims to be a research firm. FBR is a franchise marketing lead generation website. They are doing with this report what the FTC and certain states do not allow. FBR is charging its franchisors for an unlawful earnings claim service. Franchisors mostly would never do this themselves excepting for the aggressive violators. Franchisors wouldn’t not even been lawfully able to provide this report to prospective franchisees. No franchise lawyer worth their salt would let their franchisor client use FBR. FBR Critic pointed out that the FTC forbids franchisors from making Financial Performance Representations (FPRs, aka “earnings claims”) unless they have substantiation for the claims and they are disclosed in Item 19 of the franchisor’s Franchise Disclosure Document (FDD). What surprised you most about opening your own business? We did close to one million dollars in sales in the first year, I couldn’t have predicted such success in such a short time. It was an incredible achievement; and indicates that the moving market is filled with opportunity. It’ll be another busy year for our You Move Me business. After doing $1.3 million in revenue in 2014, we’re projected to hit about $2 million in 2015. For an expanded analysis of Andrew Wilson’s claims, read YOU MOVE ME Franchise Brian Scudamore Making Illegal Earnings Claims? In the Item 19 of its 2015 FDD, FBR advertiser ShelfGenie includes representations regarding the dollar amount of the average order in 2013, the meeting-to-sales ratio and the cost-of-goods sold… but it declines to include overall profitability of its franchises. …He invested in his first ShelfGenie franchise in 2009. During his first year in business with ShelfGenie, he broke even. By the second, he was profitable…. HomeWatch Caregivers make financial representations regarding gross sales and average staff wages in its 2014 FDD, but does not provide information regarding when and if franchisees break-even. Leann Reynolds, president of Homewatch CareGivers, says franchisees typically break-even (revenue minus expenses and not counting owner salary or loan payments) in 6-9 months. “I was able to break even within 6 months, so the wait time is not long if you launch successfully and begin to grow,” said Synergy Homecare franchisee Mitch Opalski. This is an unlawful way to make a earnings claim. This may rise to be criminal conspiracy. These are franchisors and franchise marketers who know franchise compliance and who are collaborating to violate the law. What do you think? Is Franchise Business Review and its franchisor advertisers collaborating to circumvent the FTC Franchise Rule? Or are these statements not, in fact, illegal earnings claims? ARE YOU FAMILIAR WITH FBR FRANCHISE BUSINESS REVIEW? SHARE A COMMENT BELOW. ← Is NY BAGEL CAFÉ Violating Multiple State Franchise Laws? This is quite exceptional. What are these franchisors thinking? Do they think that franchisees who are deceived won’t get a franchise attorney and show them these profitability claims? Deceptive franchisors outsourcing claims they can’t make by utilizing a 3rd party. Do they really think they can get away with this? FBR Critic is likely Jeff Johnson at FranSurvey who has never been able to scale his business model and has struggled to earn much market share so he has resorted to these types of mug slinging tactics in hopes he can take away some of FBRs business. Many of the companies that FranSurvey lists as ‘world class’ are laggards in their category and only are ‘world class’ because they pay Mr. Johnson an annuity to advertise on his site. Let’s be honest here….he’s just as much a marketer and lead generator as FBR, if not moreso. Todd, who cares who FBR Critic is? If these really are illegal earnings claims it means one of two things: That the FBR advertisers aren’t aware of it and FBR is putting them at risk, or the advertisers are complicit in it and none of those companies should be trusted. It seems a little hard to believe that Brian Scudamore who founded You Move Me doesn’t know it’s wrong to send out a magazine cover promising $1M in the first year. Plus, Todd, please link to where FranSurvey published illegal earnings claims. Yes if this earnings claims franchisor marketing bad practice extends to FranSurvey post them too. Ok, some of these examples look bad. But, now consider the Homewatch Caregivers franchise. They have a lengthy item 19, worth reading and understanding in full. But there is no mention of a break even period in the Item 19, or least that I could find. And what happens to the prospect who reads about the break even point? Read their Exhibit M -a standard disclosure acknowledgment. Well, anyone who read the the FBR report probably did want to rely upon Ms. Reynolds statement about the break even period. It is clearly a representation & not puffery. And using the Item 7 and knowing the break even point, the prospect is going to get a “new earnings claim”. And to make matters more complicated, this franchisor has a link to the FBR report or award. They may adopted the claims in the FBR and be deemed legally incorporated them into their FDD. This is all a shame because this franchisor has what appears to be a decent Item 19. Admin, you should ask the franchise attorneys for comment on their franchisor client’s franchise marketing practices. You Move Me denies any and all allegations of breach at any time of the FTC Rules on franchise disclosure, related to financial representations or otherwise. “What surprised you most about opening your own business? This is your advertorial that you paid FBR to make. Looks like You Move Me has been blasting this claim all over the Internets. Founder Brian Scudamore is an experienced franchisor… hard to defend this as an accident. When is a franchise owner’s written testimonial of profitability and sales promoted and distributed by the franchisor an illegal earnings claim? Sorry for the trick question. So why can’t franchises use these testimonials from franchisees (they sound great from profit standpoint) to market? They CAN use them as long as the claims are disclosed in Item 19 of their Franchise Disclosure Document (FDD). The FTC requires franchisors to have a reasonable basis for the claims and include disclaimers. We checked the FDDs of these franchisors and they chose not to include Financial Performance Representations of the type given here so they can’t use them in their marketing. A franchisee can share their information with prospective franchisees, but it’s our understanding that if the claim is made in the context of a franchise marketing piece or even in an article reprint provided by the franchisor, it’s the same as if the franchisor is making it directly. It looks like what was represented as a 1st year start-up may actually have been a conversion of a highly successful established moving company. If that’s true, it would be quite deceptive to tell franchisees that those results came from a new franchisee without moving experience in a brand new market. Thank you for explaining franchise earnings claims. Cuz when you looking at buying a franchise you want to know how much others are making before pulling the trigger. You want evidence that you are going to make money. My name is Jeff Johnson, and I am the founder and CEO of the Franchise Research Institute, a research company created in 2002, which is the original auditor of franchisee opinions. I have never actually visited (or posted on) this website before, but am doing so because I received an email notification alerting me to the mention of my name in the above comments. 1. I have NEVER posted or published anonymous content or commentary on this or any other digital or print forum. 2. My company is a research firm devoted exclusively to the realm of franchising, using scientific methodology which is based upon complete confidentiality for respondents, contacting EVERY franchisee (including sold, but not open), and high response rates. The origins and specifics of our methodology are published on our website: http://www.FranchiseResearchInstitute.com. To the best of my knowledge, we are the only entity conducting franchisee research using openly published, strict, science-based research methods. Our research instrument is known as the FranSurvey®. 3. We recognize outstanding research scores with World-Class Franchise® certification. In contrast with the many “best of” lists in franchising and publishing, I can guarantee that our certification cannot be “bought;” all those certified must meet our strict, research-based criteria. 4. My company is in the business of research and the recognition of excellence in franchising. We do NOT sell leads or advertising. 5. The companies which have qualified for World-Class Franchises represent a broad range of industries and investment levels. This list includes Arby’s, FASTSIGNS, Auntie Anne’s, Express Employment and Mosquito Squad. These companies (and the others listed on our http://www.WorldClassFranchise.com site) have rightfully earned certification through the broad-based, enthusiastic endorsement of their franchisees, as documented by our unbiased, third-party validation research. 6. We do NOT make any Financial Performance Representations! Thank you Mr. Johnson for your comments. It seems you are not doing marketing and franchise lead generation whereas Eric Stites and Franchise Business Review is and with earnings claims. There is another earnings-claim related issue with Franchise Business Review, which is their representations about the earnings of types of franchisees, such as Senior Care franchisees and Multi-unit Franchisees. In the 1990s the FTC came down on Blenheim Group for issuing misleading franchise earnings statistics. I think this could be a big problem for FBR if the FTC takes a good look at it. Who will submit these violations to the FTC for review and enforcement? The head of franchise investigations for the FTC reads and is a fan of UnhappyFranchisee.Com. When I finish the upcoming post on the general earnings claims by FBR, in which they post sales numbers for, say, Senior Care franchisees adjacent to paragraphs about their Senior Care clients (who haven’t filed an Item 19) implying that they’ll achieve those results, perhaps some of our readers might send the link to the FTC. The FTC issued a consent against a trade show producer for using similar tactics back in the 1990s. Have you received a response from Eric Stites and Michelle Rowan at Franchise Business Review yet? When they say they “surveyed” 28,500 franchisees, does that mean they sent 28,500 surveys out or that they received 28,500 responses? 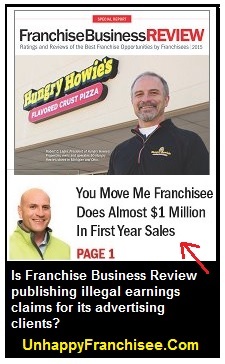 I wouldn’t trust Eric Stites or Michelle Rowan on any of Franchise Business Review’s claims or data methodology. Eric and Michelle have both been educated on franchise sales legal compliance since the have earned the International Franchise Association’s Certified Franchise Executive (CFE) designation. Has Eric Stites or Michelle Rowan responded to this? Eric Stites suggested a phone call but I asked for him to respond in writing so there can be no misquoting. Haven’t heard a response. Surprising for a research firm with a team of writers. What is Eric Stites trying to hide? Mr Stites are you a coward or can you not defend your research methodology err I mean marketing? The FTC will be coming for you. The illegal testimonial enforcement people love FBR type violators. Eric how did your call go with the enforcement people? Has anyone heard from Eric Stites?